We had a fun time taking our daughter out for her first time trick or treating tonight. By the time we were done and had taken pictures, it was 9:30p. So, I wanted to make something quick. I took a dozen or so chestnuts, cut "X"s into them, and popped them in the toaster oven for about a half hour at 425°F. While they were cooking, I chopped two small zucchinis as well as two small parsnips each into quarter-inch pieces, and a large shallot into half-moon slices. I had some corn handy, and used kernels from one cob. 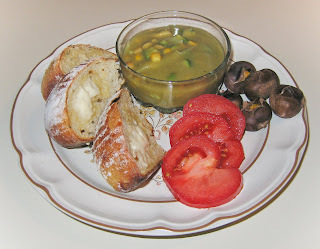 I bought a carton of Imagine brand creamy broccoli soup and used it as a base for a hearty soup. In a soup pan, I added maybe a tablespoonful of extra virgin olive oil and started sauteeing the shallot over medium heat. As the shallot started clearing, after just a minute or minute and a half, I added the zucchini and cooked for another minute, then added the parsnip. A minute later, I added the soup, brought to a boil, then added the corn and a few rosemary needles and cooked, simmering, at reduced heat until the chestnuts were ready. I added a little salt and freshly ground black pepper, and served with some delicious fresh potato-onion bread. Happy Halloween! My wife had a meal on her own tonight, so I decided to make a simple dinner for myself that I know I would enjoy but which she would probably not. 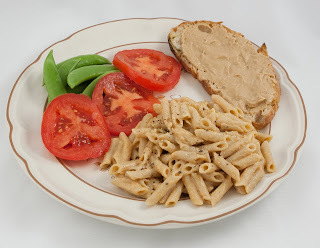 I love Road's End Organics products, and prepared their Penne and "chreese" (like macaroni and cheese) with hemp milk and Earth Balance. Sometimes, I jazz up the dish by including small chunks of onion and bell pepper, but I prepared this plain today. I love nut butters by Marantha, and had some of their macadamia and cashew nut butter on hand. Our favorite bread is from our local coop, Weaver Street Market, a lemon rosemary bread. I heated a slice of the bread just to warm it a bit, then spread this tasty nut butter on it and put it back in the toaster for just another half minute or so to warm the spread. It was so good that I made a second slice for myself! I have two new photography classes starting tomorrow and on Thursday evenings. We usually go out to eat after my photography classes, but may not go out each Wed. and Th. night. This week, though, I think we will. Tonight I put together a quick meal. Fast food doesn't have to lack in nutrition and, as I described this past May (and again in August), "there is a line of convenient Indian (and Thai, I believe) foods by a company called Tasty Byte; the ingredients are good and don't include all sorts of strange sounding chemicals, and they just require boiling for a few minutes within the foil bag the food comes in." I had on hand their Kerala (a southern state in India) Curry, and simply prepared it. 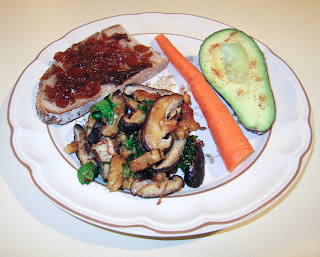 We had cooked brown rice on hand, and I sauteed some slices of tempeh. Avocado finished off the meal. Not bad! I found some nice, thick, large shiitake mushrooms in the grocery store, reminding me of the (rare) flushes of shiitakes we get on our shiitake log. I started a simple saute with 1/3 package tempeh cut into maybe 1/4" to 1/2" cubes, and a medium shallot, diced to 1/4" cubes. I wanted the tempeh to be crunchy, so let it saute over medium heat for perhaps five or six minutes. Then, I added about eight large shiitakes, sliced thickly. Once the mushrooms cooked down a bit, after perhaps 3 or 4 minutes, I added about a dozen leaves of baby spinach and cooked another minute or two. I mixed in some salt, fresh rosemary and fresh lemon sage from my garden, and coarsely ground black pepper. At A Southern Season gourmet store a few days back, I found an interesting British sweet onion marmalade. I heated a slice of La Miche bread and spread the onion atop; it was pretty good but not memorable. But the dinner was good and surprisingly filling! By the way, I received my first comment on the blog from a reader of Our State magazine who had seen my article in the November issue. I can't wait to see the article! I was shopping with my daughter at A Southern Season, a gourmet store, today, and found these interesting "Fieri" brand crackers by a company named La Panzanella. I purchased their Chipotle flavor, but would love to try the others, as well, such as Serrano Lime. On the drive home, I came up with an idea for a main course with these crackers that appeared (and proved) to be quite sturdy and thick. I love the combination of mushrooms and seitan. Over medium-high heat, I started sauteeing a medium diced clove of garlic, as well as two medium shallots cut into half moons. A minute or so into the saute, I added half of a box of seitan, cut into thin rectangles maybe 1/2" x 3/4", and another minute later added about 15-20 small crimini mushrooms, cut into halves or thirds, depending on mushroom size. I cooked, stirring occasionally, for a good length of time, perhaps 10-12 minutes, to let the seitan get nice and crispy. I then quickly increased the temperature to near high, added several tablespoons of port, and let the alcohol cook away with the port flavor being absorbed into the mushroom and seitan. I mixed in some salt and freshly ground black pepper. 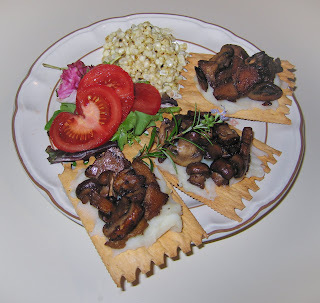 On each of three of these crackers I spread a thin coat of some olive oil-garlic mashed potatoes that I had prepared. Starches are great to get things to stick, and that's just what I did - I served the seitan saute atop the potato, carefully gently pressing down. A sprig of rosemary, salad, and corn-off-the-cob with a bit of lime and salt as well as Earth Balance margarine filled out the meal. My wife and I were very pleased with the meal. One thing I might change, however, is to marinate the seitan in a lime base to add an interesting citrus taste dimension. I had considered adding some tomato paste atop the cracker, before the potato, but am glad that I didn't do that. Our new local vegetarian restaurant, Butternut Squash, has asked me to submit one of my recipes for them to rotate into their menu, and I think I'll offer this, at least for now! For tonight's dinner, I had picked up a medium bag (say a large lunch bag sized) full of braising greens. I cut up a vegan Field Roast Grain Meat Company artisanal chipotle sausage into small pieces and started sauteeing over medium-high heat. After a minute or two, I added a medium onion, cut around into half and then into half moons. I let the sausage get crispy, which took perhaps 5 or 6 minutes, then added the greens little at a time, letting them cook down. 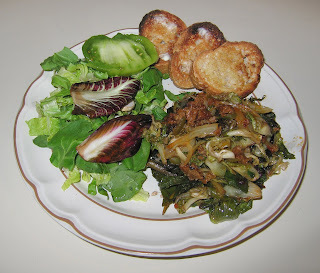 I served this with a big salad; the plate was getting too green, so I actually pulled out some red leaves from the braising mix early in the saute, when the red was bright, and added that to the salad. Some whole wheat baguette slices rounded out dinner. Yesterday, we attended a nice, classy wedding. It was fun to attend a wedding I wasn't photographing! We had a simple mixed vegetable over hunk of tofu saute; my wife doesn't eat tofu, so we had something light in addition once we came home. Tonight, we went to a sitar concert. My wife had a very early meal of dhal (lentil soup) and rice, and the very nice samosas (Indian savory turnovers) that they had at the concert filled her up. I brought some samosas home and made a simple meal for myself. I heated some prepared leftover Tokyo buckwheat soba noodles, along with a Cajun tofu that I recently found that I love from Whole Foods Market, fresh broccoli, and 1 1/2 samosas.